Having filled the card on my digital camera, I downloaded the pictures I’ve taken from Hwy 321 onto my netbook. Thinking I could work better on that, I downloaded the pictures from my other cards. It turns out I’ve taken around 1600 photos of a 90 mile stretch of road. Wow. And since then I’ve taken 54 more. In a few months I’ll be moving so it’s near the end of the photographic documentary of that road. It’ll be interesting to see how many pictures I’ll have at the end and how many make it through the editing process. So, what to do with those pictures? I’ve been thinking of making a photo book from them. It would be nice to sell it to people wanting something of rural South Carolina. I remember one year my mom searched high and low for a simple book to give to relatives and finding nothing that would fit in a suitcase and cost less then $20.00. We ended up getting postcards. Which is another thing I’d like to do with my photos, but not postcards I’d sell, just something to give to relatives or people I meet when I go on trips. Sometimes it’s hard enough to explain just where South Carolina is. When I visited Morocco I tried to explain its location to a man who lived for a while in Alabama. I still don’t think he got it. Explaining how South Carolina looks like is another matter. There are beaches, swamps, mountains (foothills rather), lakes (manmade) and rivers. Now I’ll be able to whip out a postcard and show them and even give them a card. You can print them out at Wal-Mart for about a quarter and put several photos on one card. I did that to show my aunt in Germany what Arkansas looked like and it turned out quite well. I won’t stop taking photographs. I plan to make Columbia, SC by next target. My blurb book covers are boring. Actually I think they’re okay, but upon having an excellent idea, I am revamping the book cover for my third travel book. After gazing at other people’s covers I am thinking to combine a background behind my photo, something bland, no, that’s not what I mean, something that won’t distract from the picture and the title. A texture. I want a visual texture instead of a color. And I have those. Blurb doesn’t have any, I checked, but throughout my life I have always liked to take pictures of texture – a rock, a path, walls, faded doors, windows, trees. The photo I have selected for this book is that of Niagara Falls. That takes up most of the book anyway. The background I see for this is canvas. Wouldn’t you know it, when I went to the EdTech conference this year I got a canvas bag. Hot dog. Take a picture. Upload it. Stick it in. From now on I’ll be looking for more texture shots. These will be coming in handy. This is one of those pictures that end up cool even with the first perceived problems such as the mesh screen. 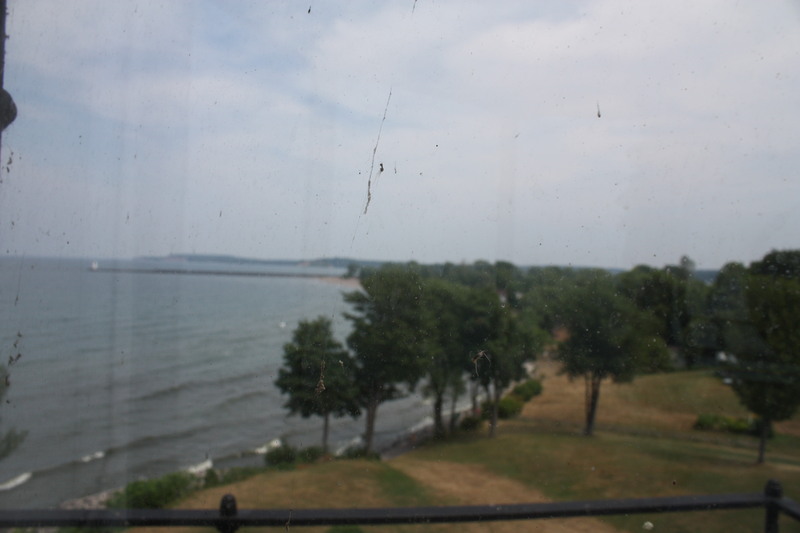 Taken from the top of Sodus Lighthouse, it shows a view of Lake Ontario. I wanted a nice shot of the lake from up high and I worried the mesh would cause problems, but it came out great even with the bug splatter. That’s a great thing with a digital camera; you can take as many pictures as you want and not worry you’re running out of film. Okay, so you might run out of space on the memory card, but you get much more than 32 pictures on a roll. Sodus Lighthouse is located east of Rochester. It’s a small village, one I put on my route because I thought this might be the only lighthouse I’ll see. Not so, but who cares. Lighthouses are nice and great picture taking opportunities. They have a nice museum on the ground floor, well worth the money. Rock City, NY, close to the PA border and in the Allegheny Mountains. 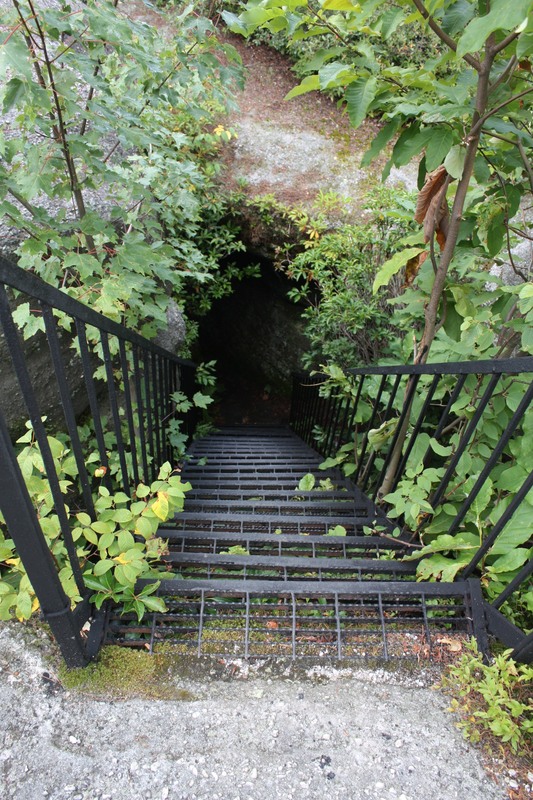 These daunting steps make one wonder what’s below. A maze? A mystical wonderland? A cave? Standing up one top and looking down, one anticipates an adventure. Govan is just a stretch of houses along the railroad track that shadows 321. On one side are a few residential homes, a business or two (I can’t tell if one building is abandoned or being used), and two pretty large churches. On the west side are fields and farms. 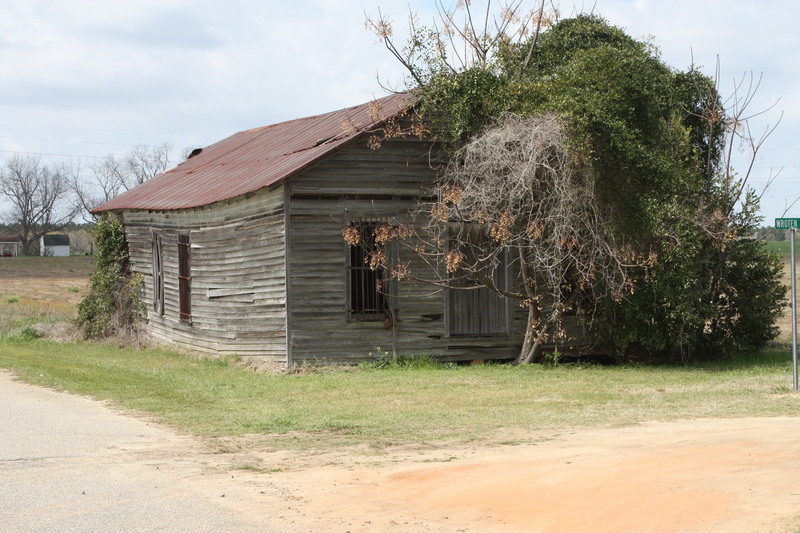 There are two old houses here, with their sagging roofs and curved walls, one on either side of the dirt road. I plan to take another photo of this one as the setting sun lights its flanks, warming the wood. 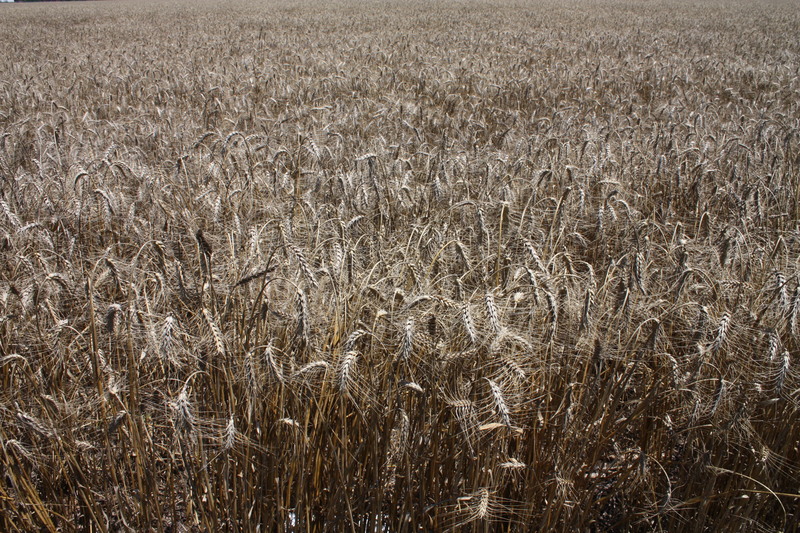 Wheat is one of the crops grown in the low country of South Carolina along with corn, cotton, soybeans, and pine trees. This field is one of several large ones just north of Fairfax. I’d taken pictures of it earlier in the year when it had been green, but now it’s ripened and turned brown. Unfortunately I missed when they harvested it. After the wheat had been harvested, soybeans were planted in the same field. 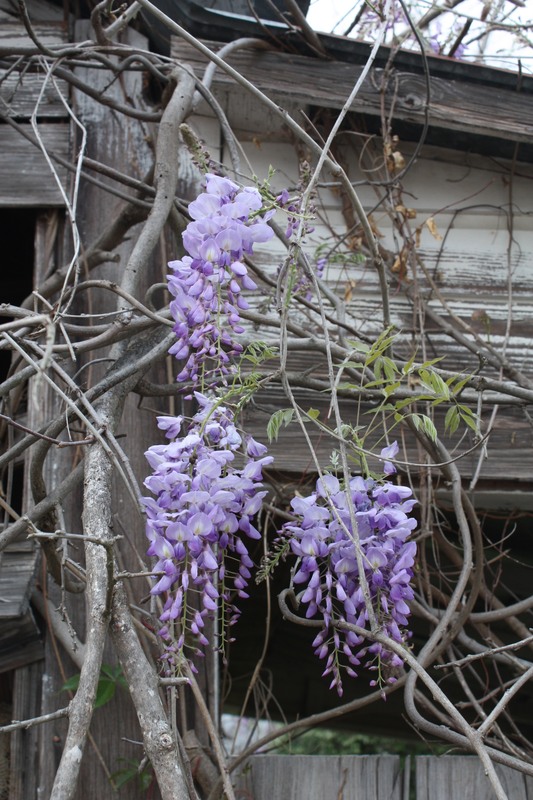 Wisteria doesn’t bloom for long, maybe a week or two. I found these draped over an old shed by an empty house in Brunson. While not on SC highway 321, it is on my route and I had to stop. The walls of the house and shed have been bleached a gray by the sun. While I stood there taking pictures, a truck driver pointed out a squirrel who had peeped out of a house through a hole. I wasn’t quick enough to take a picture, but I did catch a glimpse of it as it disappeared.